The new line by Mud Pie Resort Wear includes, swimsuit cover ups, lace shorts, Chevron Maxi Dresses, Chevron Maxi Skirts, and bell sleeved tunics. The hot style and colors this season is the all new striped black and white in clothing and accessories. 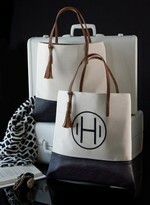 Take a look at the all new striped black and white totes and swimsuit cover ups. Coordinate your new striped black and white outfit with one of our new designer inspired black and white handbags. Love that Look! Remember to add your swim pants and all over lace lined shorts to your new Resort Wear collection.